How to have a limitless mindset as a mom. I went to a conference this weekend with Kris Carlson. It was all about having a limitless mindset. Do you set limits on what you are capable of? Do you do hard things? Are you stretching yourself? Do you set goals? Who is your coach or cheerleader? Do you have someone cheering you on? This conference was very inspiring and got me thinking about how that applies to us as mothers. 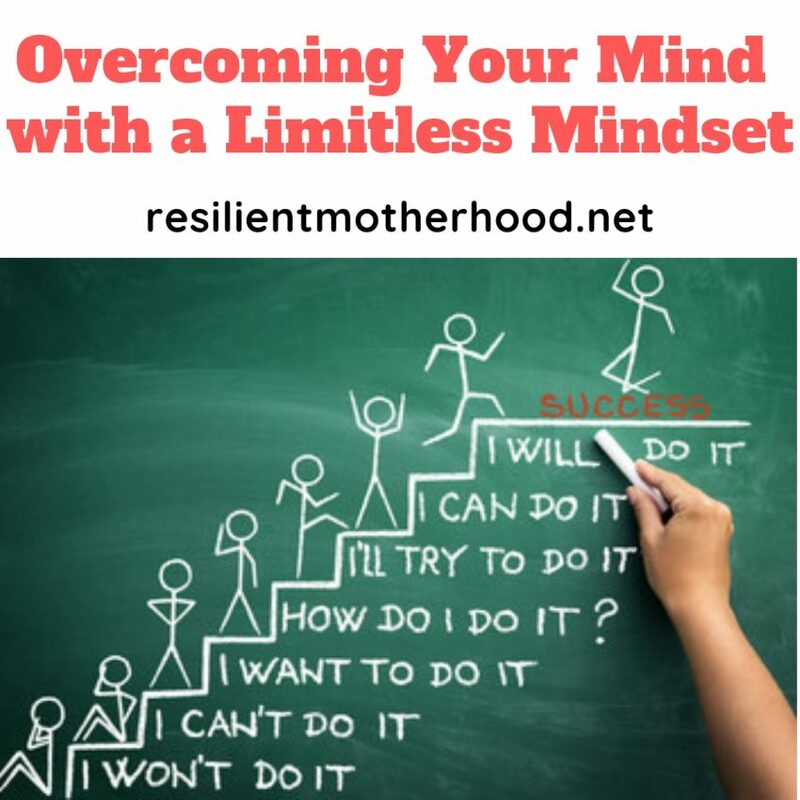 How can you have a limitless mindset in motherhood? I wonder if we could control and focus our mindset, would that impact our lives and the lives of our children? One thing that challenges moms is trying to be someone else. Trying to compete or keep up with the Jones’ is a bad place to be. Really the best thing you can do is not to try to be anyone else but to be You! Be the You that God intended. Do things your way. Sure you can take ideas from other moms but make them your own. Make them work for your own situation and for your family. Try something out—>if it fails—>learn from it—>improve what you did—>and try again. Then you will start to see success. In our training they said that, “80% of success comes from the 20% of your daily activities”. As a mom, think of those daily activities, the little things you are doing and teaching your kids. Those little things will make the biggest difference in your life. Sometimes those daily routines distract us from our ultimate goals. We lose sight of our focus for ourselves and for our children. Keeping your ultimate goal in mind helps all the little things stay in focus. What is your purpose and mission. What is your vision of you? Your vision of your kids? Vision will bring focus and peace in everything that you do. I asked some moms what their dreams were to achieve as a mom. 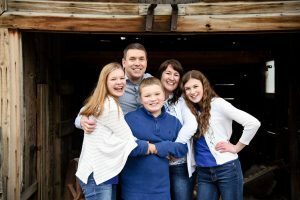 The answers were that they wanted their kids to be stable, happy, hardworking, productive, spiritual, and independent people. If those were your focus and goal for your kids, how would you treat them now? What would you do differently every day with them? Your mindset really does affect so much of your life and your ability to succeed. Don’t let all the negative, disappointing, “I’m not good enough”, “I can’t” thoughts in to stay. Replace them with the positive ones; “You can”, “You are Amazing!”, or “You’ve got this”. Imagine the outcome when you think those thoughts instead. Hillary Weeks did an experiment about using a clicker to count all of the positive thoughts she had. She found that focusing on the positive thoughts helped her be happier. Be aware of being aware of what you are thinking. Pay attention to when negative thoughts come to you and replace those with positive, uplifting ones. Physically say “STOP!” if you need to stop the bad thoughts immediately. Thoughts become feelings, and feelings lead to actions. Your positive thoughts and outlook will lead to success. I have found that having a positive attitude affects everything else in my home. Your energy as a mom is contagious, good or bad, your attitude will spread to the rest of your family…so be positive. Every day is a brand new day. Every hour is a brand new hour. Celebrate small wins, small accomplishments and small victories. Focus on the positive. Don’t dwell on your mistakes, make amends if you yelled at your kids, say sorry, show more love, and move on. Let the bad go and focus on the positive things in your life and you will see a difference in your kids as well! Being a mom isn’t always easy. You will have struggles as you try to figure out this new life of yours. Remember that resistance helps you grow and it strengthens you. Those challenges help you be a better person. Make up your mind that you can overcome anything that gets thrown at you! I think of it like weight training…resistance pushes you and strengthens you to build muscle and be stronger. Resistance in life does the same thing! If you push yourself through the hard times, you will be stronger! Don’t quit mentally, keep going through the bumps, be steady in your daily efforts, and you will see amazing growth and resilience occur. Keep at it! You can do hard things! Visualize yourself being successful. Turn your weaknesses into strengths. Try not to compare your weaknesses and bad days to someone else’s strengths and best days. Social media shows us everybody’s best, most fun days. Don’t worry about if they home-school their kids, use formula, have lots of fun toys, or can afford that trip. Comparisons will drive an invisible wedge between you and that person. Instead, we should embrace differences. We should stop judging them as well as stop judging ourselves. We should replace criticism with grace. Look for ways to be kind and show love and inclusion of others. Just know that we all struggle. We all have difficult times. Focus on similarities and kindness and you will go far! Look for friends that will lift and inspire you to be better and push you to accomplish your goals. “If you think you are beaten, you are; If you think you dare not, you don’t If you like to win but you think you can’t it’s almost a cinch you won’t. If you think you’ll lose, you’re lost; For out in the world we find Success begins with a fellow’s will: It’s all in a state of mind. If you think you are outclassed, you are: You’ve got to be sure of yourself before you can ever win a prize. Count your blessings-Showing gratitude will bring so much peace to your mind. Make a mental list of good things or times in your life when you were blessed. I think your list will surprise you. Practice happy thinking. Make a mental list of happy thoughts, songs, places and think of them throughout the day. Don’t try to be others-be You! Nobody can be You quite like you can. Remember your strengths, talents, and abilities. Find time each day to clear your mind and meditate. Go to a higher power. For me prayer and scripture study are the beginning and ending of my day. They really help clear my mind and bring a peace to me. Get up in the morning and choose happiness. You can simply choose to be happy! Charge your batteries. We really aren’t energizer bunnies! Think about what lifts you, gives you hope, and fills you with joy? Do those things that will help you be happy. I like crafts, sports, walks with my husband, visiting beautiful places in nature. Those things center me and help me to carry on. Find ways to handle anger. Don’t let it control you. Cool it before you regret it. Find what sets you off and fix it. Try for the next 24 hours to only speak positively, optimistic, and hopeful about everything, your home, your kids, your spouse, your future. Mental focus really makes a difference! Serve others. You will find so much peace from that! No matter what happens in your life or in your mind, you have someone who can help you overcome every challenge. No matter what you do, God loves you and will help you through it all! His love for you doesn’t change no matter what you do! He wants you to succeed and He will help you! Just ask! Happiness comes from feeling God’s power-You can be touched by His power. Trust Him. He knows more about your job than you do. He knows what struggles you have and He will help you through it! Draw on a higher power. Believe you can and you can achieve it!